As we round into the third week of October, most of my work starts to focus more and more on horror films and Halloween. The great part about it is that I love both. The fun part? Sharing it. I curated a 31 film Halloween feature this year for MITNG.org. The idea was to provide a list of films featuring horror greats to lesser known gems – reminding people of their favorites and possibly shedding some light on films readers might enjoy. No small feat considering the saturation of such film lists on the internet around this time of year. 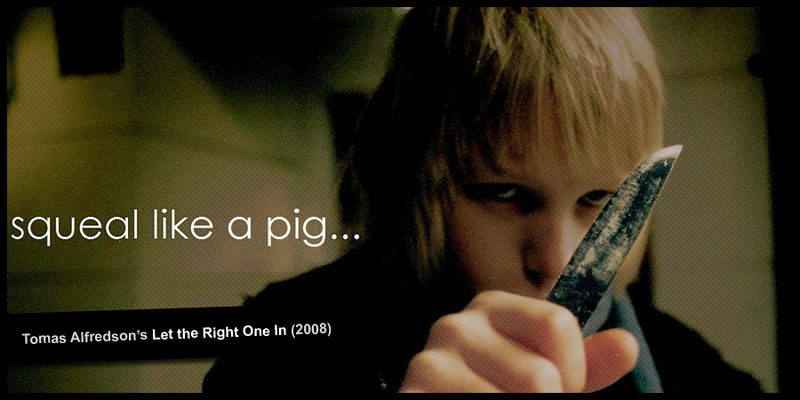 One of my favorite films on the list is Let the Right One In a Swedish gem based on the 2004 novel of the same name. It’s a terrific film about love and vampires. Oskar, the film’s protagonist, is a 12 year old boy who endures a litany of bullying from his classmates. As the film opens, Oskar is fantasizing about standing up for himself. This was the inspiration for my quick create this week. The great thing about this moment in the film is captured by the anger in his eyes where it manifests in a kind of blankness – you can see the rage but it’s clear Oskar has no idea how to vent it. The blade is turned upward, not down revealing how little the boy knows about defending himself. And while the scene is very yellow, warmed through filters, I choose to go all in with reds and blues – pulling inspiration from Oskar’s rage, the central vampiric themes in the film, and blues/grays for the harsh winter against which the film is depicted. I used a variety of texture brushes to create a sort of crinkled paper backer against which Oskar sits – an homage to the brilliant adaptation from page to screen by John Ajvide Lindqvist. If you haven’t seen Let the Right One In I encourage you to check it out.